The Intuitive Flow Daily Double, formulated from the CST system, is an Intu-Flow® inspired program. The Intuitive Daily Double was designed to provide a detailed road map for basic skill acquisition in a simple format that only takes 12 minutes in the morning, and 12 minutes at night. 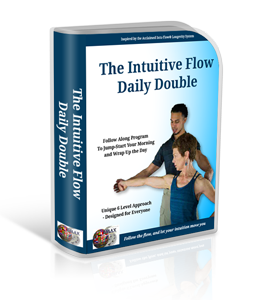 If you have ever struggled with exercises like squats and pushups, The Intuitive Flow Daily Double will guide you through the process of mastering these skills. The morning flow was specifically designed to wake up the spine by mobilizing the joints that commonly carry stiffness and tension... i.e. the hips and shoulders. Once mobilized we activate the core so that the body moves as one seamless unit rather than a bunch of broken parts; improving posture and adding that sense of "pep" in your step as you go about your day. The evening flow was formulated to combat the one activity that most of us find ourselves in on a daily basis... Sitting. This is done by reconnecting to the earth with fundamental open hip and closed hip poses to wind the body down and wrap up the day. The Intuitive Flow Daily Double offers six unique levels. The first three are for the true beginner. Even if you haven't exercised in over 20 years, you will find in these levels a refreshing way to start from scratch. The package includes 70 instructional videos designed to coach the exercises, and 12 full-length follow along videos to make following the programs smooth and easy.